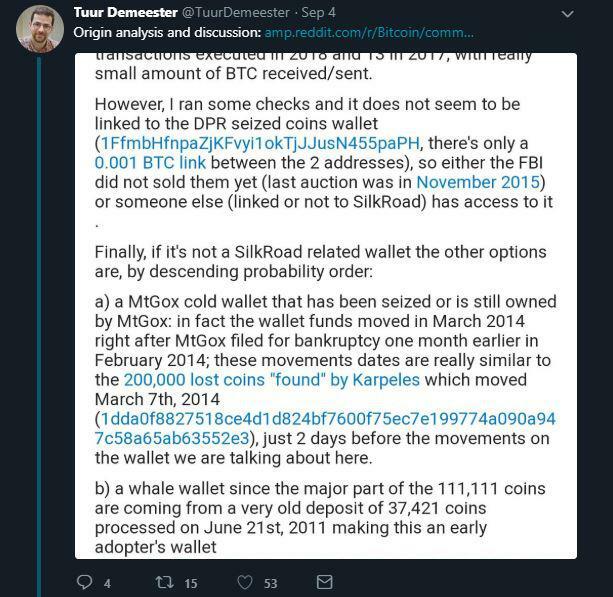 Two of the three possibilities were a Silk Road wallet, and one belonging to Mt. Gox with the third being a possible Bitcoin early adopter. Sick Silk stated the funds were on the move before the Mt. Gox bankruptcy filing and that the funds moved on dates similar to when Mark Karpeles found lost Bitcoins. Twitterati, Tuur Demeester, posted a picture of the Reddit users statement and asked for the opinion of Wiz Security. WizSec responded saying that the Bitcoins belonged to an old Mt. Gox whale and had no connection with Silk Road. The tweet leads to a social media escalation that Mt. Gox was going to be responsible for another market crash. WizSec then clarified saying that the Bitcoins didn't belong to Mt. Gox but to someone who bought them during the same timeframe. Market speculators believe that this is responsible for the pullback over the last few weeks seen across the market. Mt. Gox has been held responsible for the biggest crypto market crash so far, including the December 2017 crash where Bitcoin recovered and ran to an all-time high in March 2018. Mt. Gox was the largest cryptocurrency hack of all time and happened in 2014. At the time Mt. Gox was the largest cryptocurrency exchange platform in the world, handling over 70% of the worlds Bitcoin transactions. Mt. Gox collapsed after a hack stole 7% of the worlds circulating Bitcoins worth approximately $471 million. CEO of Mt. Gox, Mark Karpeles, declared bankruptcy at the time of the hack. The bankruptcy declaration was followed by Karpeles announcing he came across several cold wallets containing large amounts of Bitcoin. These bitcoins are part of the civil rehabilitation filing and are all to be paid to creditors.